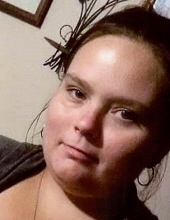 Tiffany Brooks, age 29, of Williamsburg, Kentucky departed this life on Sunday, January 27, 2019 at the Greg and Noreen Wells Hospice Center in Hazard, Kentucky. She was born on November 15, 1988 in Corbin, Kentucky to Jessie Richardson and the late Linda Sue (Carr) Richardson. She was also preceded in death by her grandmother, Bessie Carr. She is survived by her husband Wayne Brooks of Williamsburg; son, Nathain Brooks of Williamsburg; father, Jessie Richardson; sister, Jessica Richardson; grandparents, Roy and Sue Carr of Williamsburg; and a host of other family and friends to mourn her passing. Visitation will be from 1:00 P.M. until the funeral hour on Friday, February 1, 2019 at Croley Funeral Home. The Funeral Service will be at 3:00 P.M. Friday, February 1, 2019 at the Croley Funeral Home Chapel with Rev. Jerry Sester officiating. To send flowers or a remembrance gift to the family of Tiffany Brooks, please visit our Tribute Store. "Email Address" would like to share the life celebration of Tiffany Brooks. Click on the "link" to go to share a favorite memory or leave a condolence message for the family.